1st Church Preschool utilizes the Connecticut Preschool Curriculum Framework to guide its curriculum in the development and implementation of its educational program. Our curriculum offers opportunities for learning and skill development in the areas of language, literacy, cognition, creative arts, science, social studies, mathematics, health and social-emotional and physical development. Children are encouraged to make choices and to participate in a range of activities that include block building, dramatic play, indoor climbing, crayons and paint, water and sand play, play with paint and crayons, play-dough and clay, water and sand, reading and listening to stories, music and movement, puzzles and manipulatives, cooking, and caring for plants and animals. Outdoor activities include swings and climbers, sand and digging boxes, water tables, tricycles, a playhouse, open space and gardens. Teachers organize activities and set up indoor and outdoor environments so that children can play by themselves, with others, and with a variety of materials that encourage skills such as problem solving, artistic expression, small and large muscle control, visual and auditory discrimination, hand-eye coordination, and knowledge of the surrounding world. In October, November, and December, all of our classrooms come together and acknowledge these special times of the year with a “Whole School Sing.” Children enjoy sharing the songs and finger plays they have learned and practiced which are significant to that time of year. In November, we talk about what being thankful means and what we are thankful for. All the staff and children join together and share what they are thankful for. Each child brings a fruit, vegetable, bread or muffin to share at the gathering. Everyone has lunch together while getting a chance to visit the “Sharing Tables” to sample the foods brought in by the children. March can sometimes seem like a long month, especially after many cold weather days that may keep children indoors. To add some interest to our curriculum, we provide a week of “movement” for the children. Each classroom sets up unique, theme-based activities which integrate creative arts, math and science with fine and gross motor activities. Children enjoy having the freedom to explore the classrooms and participate in the variety of activities offered in each room. In June, when the weather invites us to spend more time outdoors, our outdoor Field Days allow children to spend the entire morning outside. Teachers plan special outdoor gross motor activities such as parachute play, water relays and fly-swatter painting, to name a few! Children travel in small groups from activity to activity enjoying the extended outdoor play while getting lots of exercise. We enjoy a whole group picnic snack on the lawn and finish off the morning with outdoor playground time. 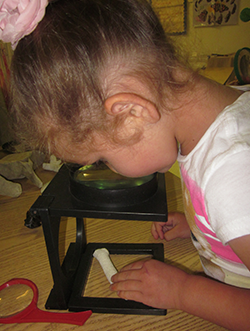 At least twice a year, we enhance our curriculum by bringing in outside enrichment programs. These programs offer extensions to classroom learning in the areas of literacy, music, science, social studies and gross motor development. 1st Church Preschool utilizes both formal and informal assessment methods which include observations, questionnaires, and checklists. Using these methods, we assess children’s skill levels and their progress on clearly defined learning goals. Teachers use the information gathered from their observations and assessments to guide their weekly curriculum planning and activities for the overall classroom as well as individual children. This information helps to better understand the individual learning styles and needs of each child and is used to create individual goals. Family members are provided information about their child’s progress on a regular basis. A formal written assessment form and a child profile graph are provided to parents twice a year, once in the fall and then in the spring. Parent Conferences are also offered in the fall and spring and provide a time for parents and teachers to talk about their child as seen in different environments, assessment information, classroom work and children’s progress in all developmental domains. Teachers and parents work together to create individualized goals that guide on-going curriculum and activities for their child.